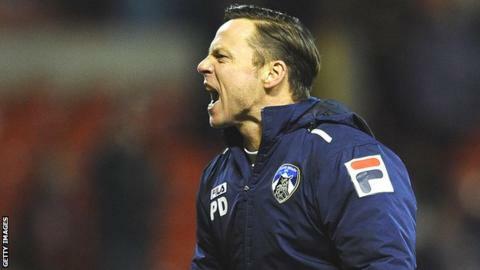 Manager Paul Dickov says Oldham can take heart from Bradford's League Cup exploits as they prepare to face Liverpool in the FA Cup fourth round. The Bantams have on their way to Wembley. Dickov told BBC Radio Manchester: "They are a fantastic example for us. It lets everyone know there's a bit of hope there for clubs like ourselves." Sunday's fourth-round tie against Liverpool is a repeat of a third-round encounter at Anfield last season. Midfielder Simpson told BBC North West Tonight: "That was one of my favourite days ever in football. "Hopefully we can have a better scoreline this year," he joked. "The goal last year was one of the best moments of my career, so if I can reproduce that, it would be great. "It will be the first time I'll ever see Boundary Park full as well. So it would be good to give the fans something to cheer about." And Dickov has insisted the League One side will go into the game against the seven-time winners believing they can prevail, despite being separated by 56 places in the league pyramid. The former Arsenal, Manchester City and Scotland striker added: "I don't think many of their players will have experienced playing at Boundary Park, especially in January. "Whether it's an advantage or not, I don't know. "Whatever they put out, they'll have good players in their team. The one thing we can do is cling to the hope that in every round of the cup, more often than not, there's a shock. "I'm positive in everything I do and every game I go into, I believe that I can win."